Dayscape was never available as a standard range, making examples extremely rare. In Mark Hill's book  on page 66 there is a picture of a 'Sun & Moon' bell vase in the Dayscape design. Image courtesy of Artius Glass. 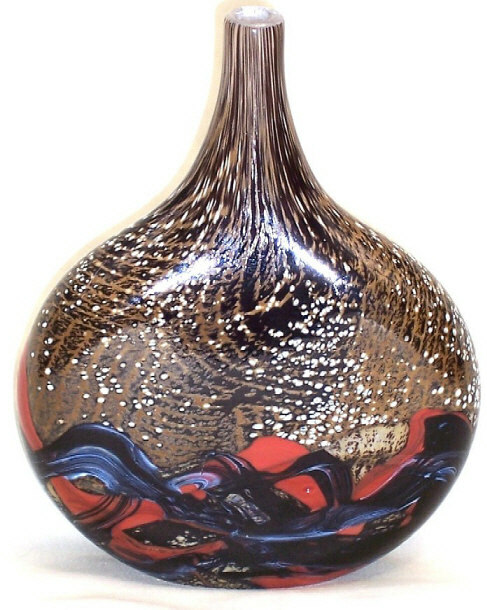 Here is another example of a Dayscape lollipop vase, showing the two sides of the same vase. It is 23 cm tall and 18 cm across. Images courtesy of Alan Fish. 1. Hill, M. (2006) Michael Harris : Mdina Glass & Isle of Wight Studio Glass. 158 pp. Mark Hill Publishing.